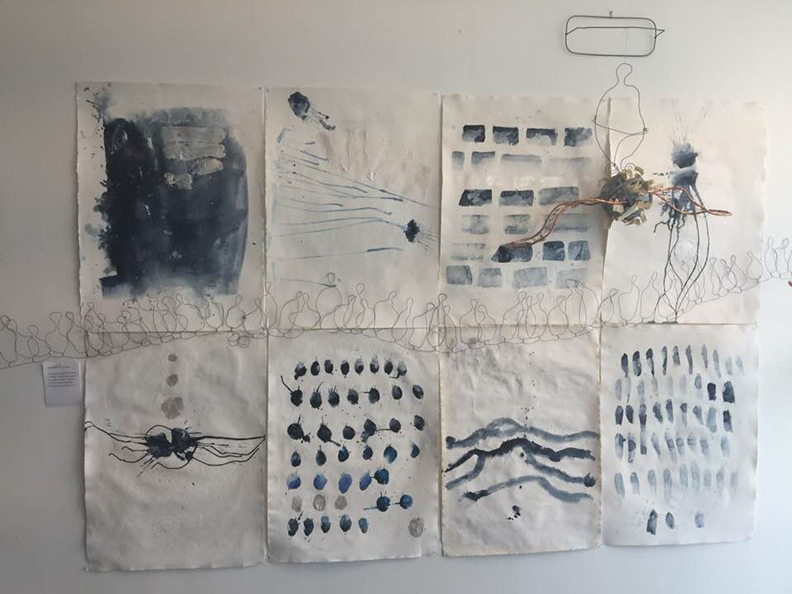 The elegant and painterly drawings that comprise Karrie Ross’ most recent Indigo series are unsettling in their rawness and emotional tenor, yet sustain a mutable and effortless power. Working in a variety of media including acrylic and watercolor, these elegantly luminous drawings are deceptively simple. Mining the same territories as artists like Cy Twombly and Joan Mitchell, Ross utilizes a relatively simple color palette in order to create more complicated relationships between structural forms. At once loose and oddly rigid, the paint as it is applied here appears both viscous and fluid, the small blue dots appearing to float in the surrounding negative space like small planets in an ever expanding galaxy. True indigo derives from the Indigofera plant, which is grown in tropical regions. Historically as well as metaphorically, the color has variegated meaning and represents the power of perception and intuition. It is said to promote concentration in times of deep introspection and trauma. Ross contrives to balance this powerful color against the simplicity of basic shapes and forms derived from imagination, intimating a hidden narrative. For example, in one drawing, we are given three lines that appear to buckle in on themselves, pushing out from the center to form a sort of watery boundary of deepening blue mitigated only by the surrounding negative space. Forms break free from the central shape like birds taking to the open skies, and it is these flourishes that hold our attention. Still other images appear as color swatches that are gradient and move from dark to light and could be read as possible Rorschach like diagrams that chart various emotional cadences. There is also an implied relationship between the drawings and the sculpture wherein each informs the other. The sculptures, as with the drawings are strangely enigmatic and reference language and a hidden narrative that seems to relate to the idea of flight. The sculpture, aptly titled “Flying Ball of Words,” is filled with the leavings of language, bits and pieces of paper cut up and strategically placed inside a sphere with copper like wings. Behind this central object is the outlined figure of a man presiding over the extended copper wings. Again, as with the drawings, the sculptural works exist somewhere between restlessness and quietude, longing and inner peace, consciousness and unconscious thought, the pushing out and pulling in of desire. There is also the suggestion here of the failed attempt at flight, the hinted narrative of Icarus’ tragic end as the sculpture is pinned to the wall and unmoving, and the bound words, the final iterations of a figure doomed to die by his own insistence. Finally, the drawings and sculptures that make up this particular body of work convey a sense of immediacy, a quickening, an urgency by their mere expressiveness as though each blue dot were a separate universe in and of itself and the fact they are in close proximity to one another further emphasizes their beauty, grace and singularity.